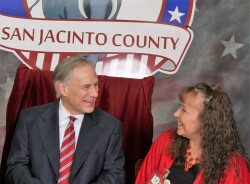 Welcome to the San Jacinto County Clerk website. Very nice pic with the Governor. Well Done. I am trying to get the legal description of a property I am buying but having no luck do you have a public site I can use to do this? Do you have Homestead Exemption Application forms on-line? If so, how do I find it? And if not, can I have one mailed to me?